How may the church join with Jesus in what he is doing through the Holy Spirit to minister God's love and life to and through families? Dennis Guernsey answers in Family Ministry and a Theology of Family: A Personal Journey, an essay in Incarnational Ministry (eds: Kettler and Speidell). Guernsey, now deceased, teamed with Ray Anderson at Fuller Theological Seminary to develop an approach to family ministry informed by Trinitarian theology and family systems psychology (click here for details). 1. "Human persons are created in the image of God and are of infinite value" (p222). Whatever defaces or destroys this imago dei is contrary to God's will and must be resisted. Accordingly, effective family ministries have a strong ethical center. 2. "Human persons are created as relational beings to exist in cohumanity as male and female" (p222). 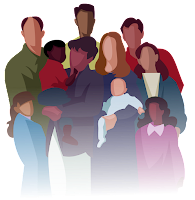 Guernsey emphasizes the conjunction and (male AND female), noting that effective family ministries facilitate the participation of both men AND women as relational persons in relational ministries that view the church itself as a relational family. If it is going to be real, Christianity must work in the most intimate of relationships: between husband and wife, parent and child, sibling and sibling, friend and friend, believer and believer, believer and unbeliever. As the people of God we paint a family portrait as we demonstrate the real presence of Christ in the world through our love for one another (p223). 4. "The church is primarily the people of God, and secondarily the place they gather" (p223). When we understand this, family ministry becomes more about relationships than about programs - about being "familied," rather than merely talking about family. 5. "Family ministry takes place most naturally wherever and whenever people feel most natural" (p224). Unfortunately, family ministry programs often are highly structured and thus rather artificial. Effective family ministries put people in settings where they are comfortable and thus can be "real" - relating with one another in natural ways. In that regard, it's helpful that family ministries take advantage of a culture's family rituals and celebrations. These gatherings tend to be centered in homes and other community spaces outside of church buildings. For some ideas related to multi-generational family ministries in a local church, go to http://genmin.gci.org/Web%20Documents/Intergenerational%20ministry.htm. You may be asking, who is Dennis Guernsey? He founded the Marriage and Family Counseling Department at Fuller Theological Seminary in Pasadena, California before going to Seattle Pacific University to develop a new Ph.D. program there in the same field before his untimely death of brain cancer in 1996.